The Kosovan government on Friday condemned the recent acts of vandalism in the country targeting Turkey and Turkish people. In a viral video, a small group of people can be seen disrespecting the Turkish flag, by stomping on it and setting it on fire. The group said they had gathered in Kosovo to support Kosovan Deputy Foreign Minister Gjergj Dedaj who had published insulting content against Turkey and Turks. In a written statement, the Kosovan government described the group behind the incident as ''racist." "The Kosovo government strongly condemns all sorts of vandalism acts that are detrimental to the state and national symbols of Turkey," said the statement. It emphasized that the government had firmly asked law enforcement authorities to take action against those who harm the harmony and coexistence of the citizens, regardless of their ethnic affiliation. Later, Kosovo President Hashim Thaci also condemned the incident. 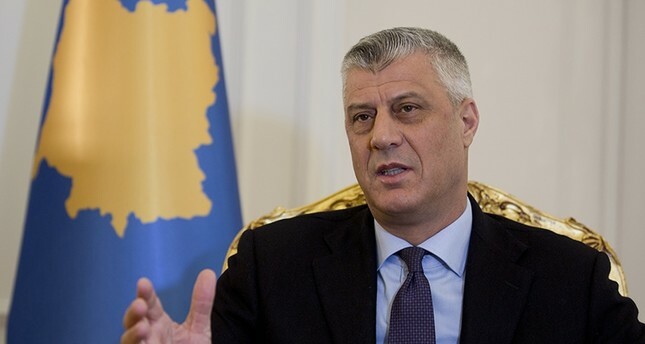 "Burning the (Turkish) flag is an outrageous act and it is condemned by Kosovo's institutions," said Thaci. He said the incident was carried out by certain elements to harm relations between the two countries. Moreover, the Democratic Turkish Party of Kosovo (KDTP) officially requested Prime Minister Ramush Haradinaj to remove Dedaj from office by the end of the week. Kosovo declared independence from Serbia in 2008 but Belgrade insists the country remains part of Serbia. Since then tensions have remained between Kosovo's ethnic-Albanian majority and a small Serb minority in the north. It is recognized by over 100 countries, including the U.S., Britain, France, Germany and Turkey. Serbia, Russia and China are among the countries which have not yet recognized Kosovo's independence.